› Author Affiliations Funding Dr. Bell's effort was supported in part by the NIH National Center for Advancing Translational Science (NCATS), UCLA CTSI Grant Number TL1TR001883. Background Given the widespread electronic health record adoption, there is increasing interest to leverage patient portals to improve care. Objective To determine characteristics of patient portal users and the activities they accessed in the patient portal. Methods We performed a retrospective analysis of patient portal usage at University of California, Los Angeles, Health from July 2014 to May 2015. A total dataset of 505,503 patients was compiled with 396,303 patients who did not register for the patient portal and 109,200 patients who registered for a patient portal account. We compared patients who did not register for the online portal to the top 75th percentile of users based on number of logins, which was done to exclude those who only logged in to register. Finally, to avoid doing statistical analysis on too large of a sample and overpower the analysis, we performed statistical tests on a random sample of 300 patients in each of the two groups. Results Patient portal users tended to be older (49.45 vs. 46.22 years in the entire sample, p = 0.008 in the random sample) and more likely female (62.59 vs. 54.91% in the entire sample, p = 0.035 in the random sample). Nonusers had more monthly emergency room (ER) visits on average (0.047 vs. 0.014, p < 0.001). The most frequently accessed activity on the portal was viewing laboratory results (79.7% of users looked at laboratory results). 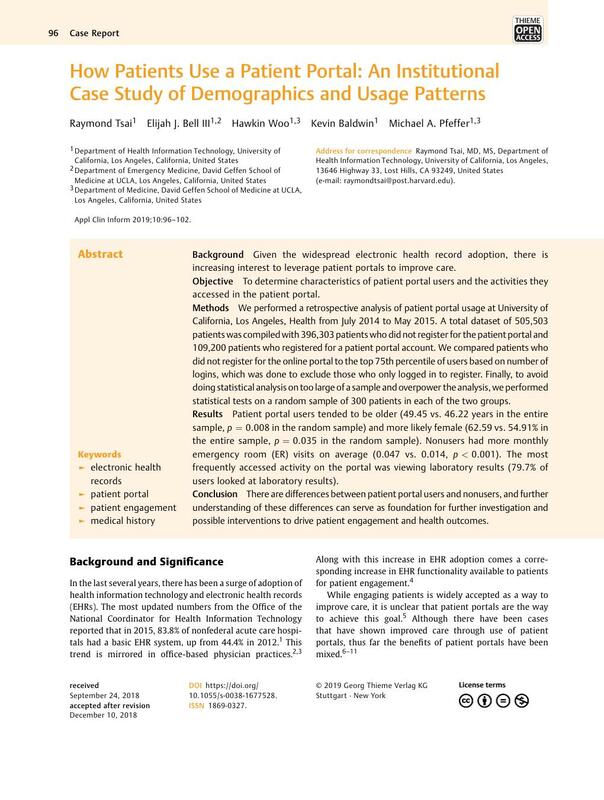 Conclusion There are differences between patient portal users and nonusers, and further understanding of these differences can serve as foundation for further investigation and possible interventions to drive patient engagement and health outcomes. The institutional review board (IRB) examined our study and determined it was exempt.